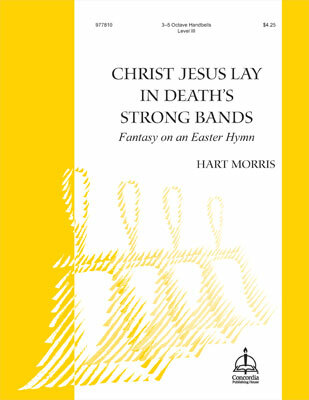 The arrangement of this ancient Easter hymn begins in a somber, chant-like style with subtle, free-ringing upper bells and low, humming singing bells. From there the piece grows from a simple and straightforward chordal style through the second and third stanzas. It culminates in a triumphant maestoso fourth stanza played over a moving bass line. The arrangement ends with a final “Alleluia” in D major. Scored for 3–5 octave handbells. Level III.